I have 5 kids, 3 of which are teenagers and all of which are going STIR CRAZY in this house!!! With 5 and then us 2, it is just simply too expensive for us to go, but the kids LOVE it!!! We intend to do the payment plan for season passes coming up for next summer! Our favorite rides are the Hawaiian Halfpipe and the Flyin’ Hawaiian!! Haven’t been able to take my kids this year and would love to take my youngest for his first time. We love the lazy river! I would love to win to have one last blast before school starts! I do not have a favorite ride, as we have never been! Thanks so much for th opportunity to win!!! We would love to go! My oldest went 2 years ago for a BDAY party and LOVED it. I would love to take both girls as a special last treat before school starts! My daughter loved the wave pool the last time we went:). Whether it’s fun in the sun, the awesome rides, or the wonderful camaraderie with friends, we would love to visit Hawaiian Falls. We have not visited all summer long, and with three, active boys, they would love to take full advantage. My boys love the lazy river, just to hang out and chill after venturing out to conquer the water coasters and slides. Thanks for considering us! Sigh….can’t tell you a favorite ride because we haven’t been able to get to HF yet. 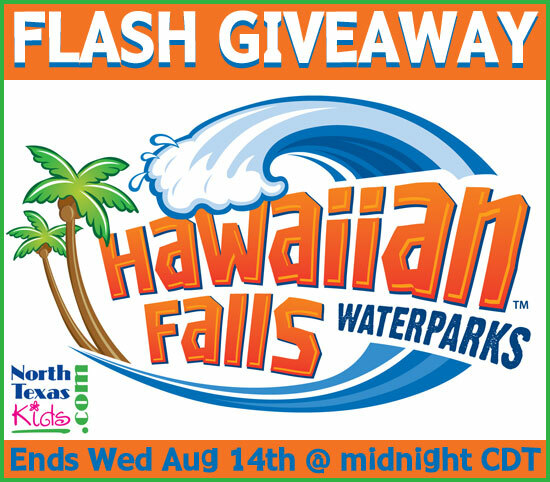 Been a boring summer with the economy as it is..expensive just to drive anywhere much less have a good time…ah, well, there’s always next year, says this Hawaiian born girl who’d love to take her son to Hawaiian Falls! Hi! I would love to win this! It would be a fun way to end the summer with the kids–5, 3, 1.5 and 1 month. 🙂 I know my older 2 would love it!! I have been to Hawaiian Falls twice as a teacher but I haven’t ridden any rides. I would love to go with my kids and experience all the fun! I would love these tickets so I can take my friend and her kids with my son and I to play and ride the lazy river! She is going through a rough divorce and I would love to give her and her kids a distraction. We have lived in Texas for 5 years and have not been to Hawaiian Falls. I know, crazy! My husband was just laid off so our summer plans came to a halt! What a wonderful way to end summer on a high note for the kids!!! My family and I would love to be blessed with these tickets. We didn’t get to make our traditional visit to Hawaiian Falls this year because my youngest step-daughter ended up in the hospital for 11 days. It ended our summer 4 weeks early because now we have to budget for future hospital bills plus back to school items. Our favorite ride would have to be the slides in the Kiddie Area. With so many little ones, they all enjoy that area. my youngest was just asking me today if we could go to Hawaiian Falls this year! this would be such a blessing! lazy river is one of our faves but all the rides are GREAT! WINNER ANNOUNCEMENT! Congratulations to our Hawaiian Falls Waterparks giveaway winner Megan T. Hope your family has a blast! Thanks for participating everyone! Don’t forget about the $10 off coupon we have on the North Texas Kids website that expires on September 2nd! We would love to go to Hawaiian Falls! My youngest has taken swimming lessons this summer and would love to go before school starts. It would be the perfect ending of summer to have a fun and relaxing visit! My kids love the wave pool! I just think it would be great to enjoy the rides at the Hawaiian Falls, for me and my kids, the most exciting would be The Flyin’ Hawaiian.